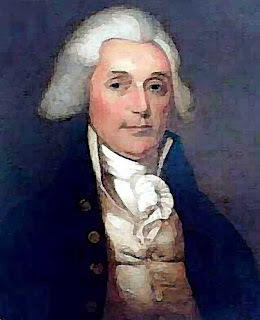 The United States in Congress Assembled elected Samuel Johnston President on July 9, 1781 but he refused the office the following day. Samuel Johnston was born in Dundee, Scotland, on December 15, 1733. In 1734 his Uncle, Gabriel Johnston, was appointed the Royal Governor of North Carolina. His parents, Samuel and Helen (Scrymoure) Johnston, immigrated to North Carolina some time prior to May 25, 1735 according to colonial records. The family settled in Onslow county and Samuel Johnston, Sr. accepting the position of surveyor-general of the colony. Senior also served as justice of the peace in New Hanover, Bladen, Craven, and Onslow, a collector of the customs at the port of Brunswick and as road commissioner for Onslow County. In 1750, Samuel Johnston was sent to a private school in New Haven, Connecticut. While in New England, his mother died in childbirth leaving two sons, Samuel and John, and five daughters, Jane, Penelope, Isabelle, Ann, and Hannah. Samuel continued his studies in New Haven graduating in 1754. He returned North Carolina and took up residency in Eden where he studied law under Thomas Barker. While in Eden, his father passed away with a will, probated in January 1757, leaving the bulk of his estate, including 6500 acres & Slaves, to Samuel and John. Urged by a group of friends to remain in Edenton, Johnston began his law practice and in 1759 was elected to the North Carolina General Assembly serving until 1775. He served in various posts while in the assembly including Clerk of the Court for the Edenton District (1768) and Deputy Naval Officer of the North Carolina province. He was fired from the naval post by Royal Governor Josiah Martin, Nov. 16, 1775, on account of his activity in the revolutionary movement. On December 8, 1773, Johnston was appointed as one of the Committee of Continental Correspondence by the General Assembly. He also served in the first four North Carolina Provincial Congresses, which met Aug. 25, 1774, April 3, 1775, Aug. 20, 1775, and April 4, 1776. In the last two he was elected President. On December 21, 1776, he was appointed by the Provincial Congress a commissioner to codify the laws of the State. In 1779, 1783, 1784 he represented Chowan County in the State Senate. Dear Sir: Philadelphia, 27th February, 1781. Your letter giving an account of Morgan's victory, I had the pleasure to receive yesterday, but have heard nothing of those sent by the gentlemen to Virginia. Our accounts from General Cornwallis are very alarming, but we hope it will not be long before both he and Arnold will repent of their rashness. Congress are not inattentive to the state of the Southern States, but the unfortunate mutinies in the Army, and other unavoidable accidents have prevented them sending on more Troops, and put it out of their power to make such ample provision for those that were sent as would have been wished. You will easily judge that great delay in the deliberative councils of so numerous a body as Congress. You will easily judge that great delay in the deliberative councils of so numerous a body as Congress must necessarily take place, add to this, that the frequent change of the members does in almost every instance break upon the best digested systems, and renders inefficient the best concerted measures. Much time is too often spent in debate, and there is no man of sufficient credit or influence to take the lead, or give a tone to the business. Another circumstance which prevents Congress from taking its measures with a greater degree of confidence and decision is, the inattention which the States pay to the measures recommended by that body. I am fully satisfied that if the States would implicitly comply with every requisition of Congress, even when the propriety of the measure was not evidently apparent, it would be attended by the most salutary consequences, as there is not the least reason to doubt but Congress, both as a body and individually, are disposed to do what is right, and appear to me in almost every instance that has fallen within my observation to be actuated by the most virtuous and disinterested motives. In a few, very few instances, I have suspected individuals to be influenced by local or personal considerations, and this less often than might be naturally expected in so large a body. Never was a poor fly more completely entangled in a cobweb than Congress in their paper currency. It is the daily subject of conversation in that body; but our situation is so very intricate and delicate that I have as yet heard no proposal that is not subject to numberless objections. Johnston was unsuccessful in his attempt to strengthen the USCA Presidency. 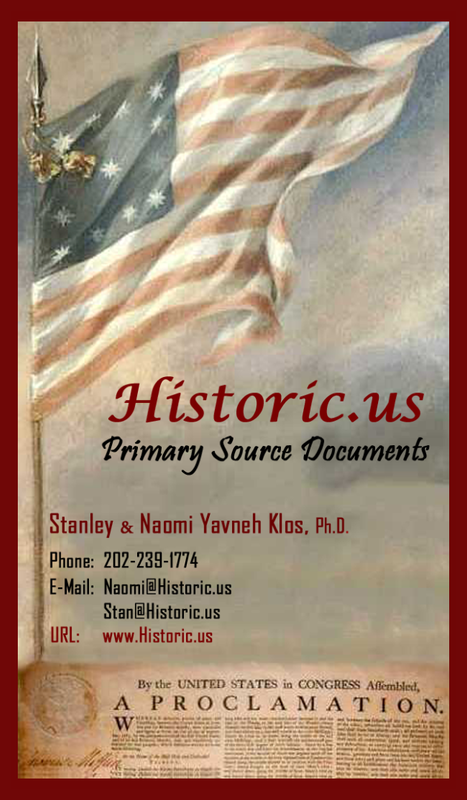 On May 4th, 1781, after three months of committee work and a final debate, the United States in Congress Assembled (USCA) approved the thirty-five rules for conducting the nation’s business under the Articles of Confederation. The new rules stripped the Presidential office of its important political power to choose when and what matter came before the United States in Congress Assembled. 1. As soon as seven states are met the President may assume assumes the chair, upon which the members shall take their seats. 5. 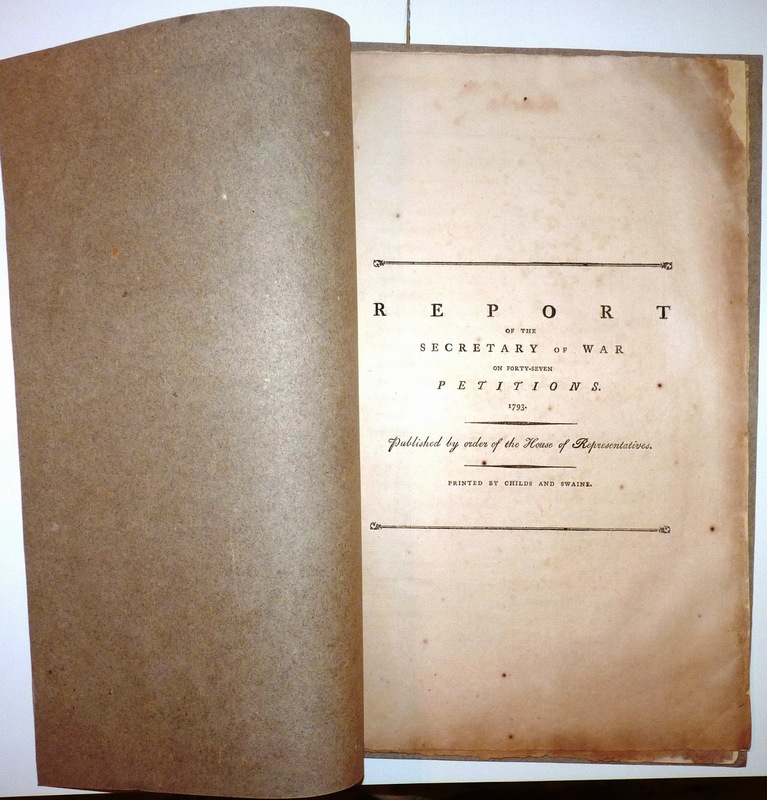 After the public letters, &c., are read, and orders given concerning them, the reports of the Board of Treasury and of the Board of War, if any, shall be taken into consideration; but none of those subjects for the determination of which the assent of nine states is requisite shall be agitated or debated, except when nine states or more are assembled. When a doubt is raised whether any motion or question is of the number of those for the determination of which in the affirmative the articles of confederation require the assent of nine states, the votes and assent of nine states shall always be necessary to solve that doubt, and to determine upon such motions or questions. 6. When a report, which has been read and lies for consideration, is called for it shall immediately be taken up. 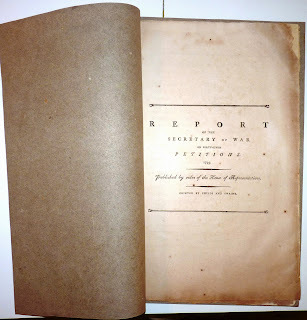 If two or more are called for, the titles of the several reports shall be read, and then the President shall put the question beginning with the first called for, but there shall be no debate, and the votes of a majority of the states present shall determine which is to be taken up. 8. When a report is brought forward for consideration it shall first be read over and then debated by paragraphs and each paragraph shall be subject to amendments. If it relates only to one subject being in the nature of an ordinance it shall be subject to such additions as may be judged proper to render it compleat and then it shall be read over as it stands amended and a question taken upon the whole: But if it comprehends different subjects, independent one of another, in the form of distinct acts or resolutions a question shall be taken on each and finally a question on the whole. 9. No motion shall be received unless it be made or Negatived. seconded by a state. 9. When any ordinance is introduced by report or otherwise, it shall be read a first time for the information of the house without debate. The President shall then put the following question "Shall this ordinance be read a second time." If it passes in the affirmative then a time shall be appointed for that purpose when it shall be read and debated by paragraphs and when gone through, the question shall be "Shall this ordinance be read a third time"; if agreed to, and a time appointed, it shall be accordingly read by paragraphs, and if necessary debated, and when gone through the question shall be "Shall this ordinance pass", if the vote is in the affirmative, a fair copy shall then be made out by the Secretary, either on parchment or paper and signed by the President and attested by the Secretary in Congress and recorded in the Secretary's office. 13. No member shall speak more than twice in any one debate on the same day, without leave of the house, nor shall any member speak twice in a debate until every member, who chuses, shall have spoken once on the same. 13. 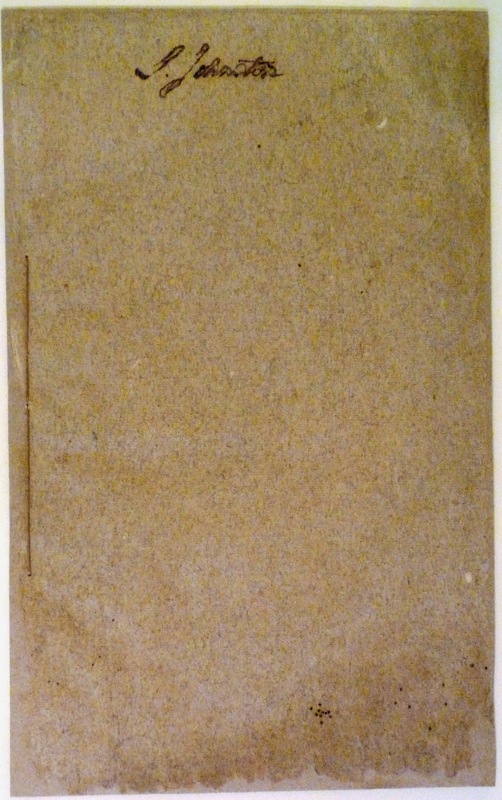 Before an original motion shall be brought before the house, it shall be entered in a book to be kept for the purpose and to lie on the table for the inspection of the members, and the time shall be mentioned underneath when the motion is to be made, that the members may some prepared and nothing he brought on hastily or by surprise. 14. When a question is before the house and under debate, no motion shall be received unless for amending it, for the previous question, or to postpone the consideration of the main question or to commit it. 15. No new motion or proposition shall be admitted under colour of amendment as a substitute for the question or proposition under debate until it is postponed or disagreed to. 16. When a motion is made to amend by striking out certain words, whether for the purpose of inserting other words or not, the first question shall be "Shall the words moved to be struck out stand?" 16. The previous question (which is always to be understood in this sense that the main question be not now put) shall only be admitted when in the judgment of two states at least, the subject moved is in its nature or from the circumstances of time or place improper to be debated or decided, and shall therefore preclude all amendments and farther debates on the subject, until it is decided. 17. A motion for commitment shall also have preference and preclude all amendments and debates on the subject until it shall be decided. 18. On motions for the previous question for committing or for postponing no member shall speak more than once without leave of the house. 19. When any subject shall be deemed so important as to require mature discussion or deliberation before it be submitted to the decision of the United States in Congress assembled, it shall be referred to the consideration of a grand committee consisting of one member present from each State, and in such case each State shall nominate its member. But the United States in Congress assembled shall in no case whatever be resolved into a committee of the whole. Every member may attend the debates of a grand committee and for that purpose the time and place of its meeting shall be fixed by the United States in Congress assembled. 20. 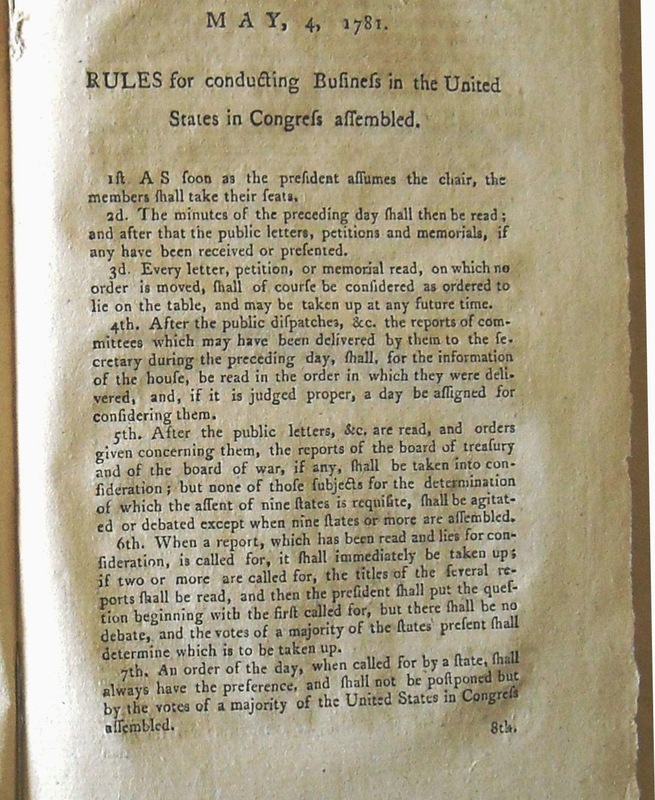 The states shall ballot for small committees, but if upon counting the ballots, the number required shall not be elected by a majority of the United States in Congress assembled, the President shall name the members who have been balloted for, and the house shall by a vote or votes determine the committee. 21. If a question under debate contains several points any member may have it divided. 22. When a question is about to be put, it shall be in the power of any one of the states to postpone the determination thereof until the next day, and in such case, unless it shall be further postponed by order of the house the question shall, the next day immediately after reading the public dispatches, &c. and before the house go upon other business, be put without any debate, provided there be a sufficient number of states present to determine it; if that should not be the case, it shall be put without debate as soon as a sufficient number shall have assembled. 23. If any member chuse to have the yeas and nays taken upon any question, he shall move for the same previous to the President's putting the question and in such case every member present shall openly and without debate declare by ay or no his assent or dissent to the question. 24. When an ordinance act or resolution is introduced with a preamble, the ordinance, act or resolution shall be first debated, and after it is passed, the preamble if judged necessary shall be adapted thereto: But if the preamble states some matter or thing as fact to which the house do not agree by general consent, and the ordinance, act or resolution is grounded thereon, the preamble shall be withdrawn or the fact resolved on as it appears to the house previous to any debate on the ordinance act or resolution; and if the fact shall not be established to the satisfaction of a majority of the United States in Congress assembled, the ordinance, act or resolution shall fall of course. is to speak first. Every member both in debate, and while the states are assembled shall conduct himself with the utmost decency and decorum. If any member shall transgress, the President shall call to order. In case the disorder be continued or repeated the President may name the person transgressing. Any member may call to order. 25. When a member is called to order, he shall immediately sit down. If he has been named as a transgressor, his conduct shall be enquired into and he shall be liable to a censure. 26. When a question of order is moved, the President if he is in doubt may call for the judgment of the house, otherwise he shall in the first instance give a decision, and an appeal shall lie to the house, but there shall be no debate on questions of order, except that a member called to order for irregular or unbecoming conduct or for improper expressions may be allowed to explain. 27. A motion to adjourn may be made at any time and shall always be in order, and the question thereon shall always be put without any debate. 30. No member shall leave Congress without permission of Congress or of his constituents. 31. No member shall read any printed paper in the house during the sitting thereof. 28. 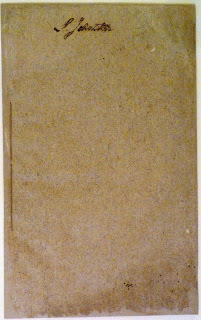 On every Monday after reading and taking order on the public dispatches a committee of three shall be appointed, who shall every morning during the week report to Congress the orders necessary to be made on such dispatches as may be received during the adjournment or sitting of Congress, upon which no orders shall have been made. The members of such Committee not to be eligible a second time until all the other members have served. 32. The habit of a member of Congress in future shall be a plain purple gown with open-sleeves, plaited at the bend of the arm. And that no member be allowed to sit in Congress without such habit. 33. The members of each state shall sit together in Congress, for the more ready conference with each other on any question above be taken that the house might not be disturbed by the members moving Postponed. from one part to another to confer one the vote to be given. That for the better observance of order, New Hampshire shall sit on the left hand of the President and on every question be first called, and each state from thence to Georgia shall take their seats in the order that their states are situated to each other. The delegates of the respective states to sit in their order of seniority. I thought about this time to be making preparations for leaving this place, but none of my colleagues appearing to relieve me, several States being unrepresented in Congress, and affairs of the first magnitude being now on the tapis, I thought it inconsistent with my honor to leave the State unrepresented at so interesting a period. Notwithstanding my anxious impatience to return to my family, I have determined to stay till I am relieved, or at least till the States are more fully represented in Congress. I don't doubt but you and my sister will offer such reasons to Mrs. Johnston as will reconcile her to this measure. I hope she will keep up her spirits and if I should not return before the sickly season, I wish you would prevail on her to take the children down to the sea-side, if it can be done with safety; but as I have hopes of returning before that time, it will be unnecessary to say anything on the subject till the season approaches. The United States in Congress assembled shall never engage in a war, nor grant letters of marquee or reprisal in time of peace, nor enter into any treaties or alliances, nor coin money, nor regulate the value thereof, nor ascertain the sums and expenses necessary for the defense and welfare of the United States, or any of them, nor emit bills, nor borrow money on the credit of the United States, nor appropriate money, nor agree upon the number of vessels of war, to be built or purchased, or the number of land or sea forces to be raised, nor appoint a commander in chief of the army or navy, unless nine States assent to the same:nor shall a question on any other point, except for adjourning from day to day be determined, unless by the votes of the majority of the United States in Congress assembled. This relegated the President to the duties of a passive chair (no agenda powers) as one of 18 Delegates (Nine States, two delegate minimum), at best, in deciding important matters of State. This new USCA Presidency was very weak in comparison to the Continental Congress Presidents who controlled the agenda, the mail (they read it first and decided what was to be brought before Congress) and were empowered to convene Congress with only one delegate present from only seven States. A Continental Congress President, after deciding what matters came before his congress, was empowered to vote on crucial legislation during the Revolutionary War as one Delegate representing his state with only six other states present (minimum quorum number was seven states with one delegate each). The USCA Presidents wielded no such powers, after the enactment of the rules, under the ratified Articles of Confederation and although Huntington had a three month reprieve on the rules, his successor was bound to passively preside. I had the pleasure of receiving your Letter of the 4th of last month and is the latest intelligence which I have received from that Country, your representation differed very little from what I expected from that quarter so I was not much surprised you were very much out, contrary to your usual Sagacity, with regard to the movements of Lord Cornwallis, indeed both Green and his Lordship have taken their Measures in a manner so diametrically opposite to what was generally expected that you were not the only person who was disappointed. The Assembly is now sitting at this place (2) and it is said discover a disposition to do great matters, but you know these people better than I do and can better Judge what is to be expected from them. You will before this reaches you have heard that a Negotiation for peace is on foot in Europe under the Mediation of the Emperor & Empress Queen of Russia. The Events of this Campaign will determine whether America is to reap any Advantages from this Measure. We have just heard of a Reinforcement having arrived at Charlestown on the 10th of this month said to consist of about two thousand men, three thousand were said to have embarked in that fleet, the remainder are supposed to have gone to the West Indies or come to Virginia. I have heard that our Assembly was to meet the 15th Instant and not doubting but the Delegates are by this time ready to set off for this place, I shall turn my face homeward as soon as completed a little business of considerable importance to our State. A new President of Congress is to be chosen tomorrow, as Mr. Huntington will not continue any longer; this honor is going a begging; there is only one Gentleman, and he from the Southward, who seems willing to accept, but I question whether he will be elected. There are some amongst us, who are so fond of having a great and powerful man to look up to, that, tho' they may not like the name of King, seem anxious to confer kingly powers, under the titles of Dictator, Superintendent of Finance, or some such, but the majorities do not yet appear to be so disposed. I greatly lament the absence of so able a representative and of so judicious and very agreeable colleague. Upon the resignation of Mr. Huntington he was almost unanimously elected and earnestly solicited to take the chair; but his ill state of health and other considerations induced him to decline it. Johnston explained the circumstances of his departure from Philadelphia in a July 30th letter to Governor Burke written on his way home. Having no prospect of being relieved or supplied with money for my expenses and my disorder, which abated a little on the first approach of warm weather, returning so as to render me of little use in Congress, I left Philadelphia the 14th, for which I hope I shall be held excusable by this State. Johnston did not appear again on the scene of national politics until 1785 when the States of New York and Massachusetts selected him as one of the commissioners to settle a boundary line dispute. After successfully resolving that dispute he was three times elected Governor of North Carolina, Dec. 12, 1787, Nov. 11, 1788, and Nov. 14, 1789. As governor, in 1788 and 1789 he was elected President of the two North Carolina Constitutional Conventions, at Hillsborough and Fayetteville, called to consider the ratification of the Constitution of 1787. Its intent is a concession of power, on the part of the people, to their rulers. We know that private interest governs mankind generally. Power belongs originally to the people; but if rulers be not well guarded, that power may be usurped from them. People ought to be cautious in giving away power. We just learn the fate of the Constitution in N. Carolina. Rho. Island is however her only associate in the opposition and it will be hard indeed if those two States should endanger a system which has been ratified by the eleven others. Congress has not yet finally settled the arrangements for putting the new Government in operation. The place for its first meeting creates the difficulty. The Eastern States with N. York contend for this City. Most of the other States insist on a more central position. 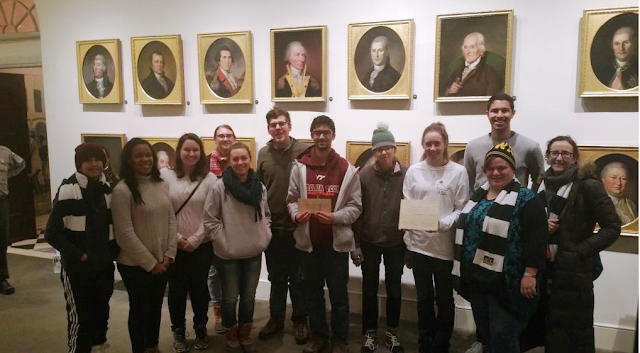 A second North Carolina ratifying convention was held in Fayetteville in November 1789 while the First Federal Bicameral Congress was debating trade legislation treating North Carolina and Rhode Island as foreign countries. Almost all expected North Carolina to ratify the Constitution because the State’s major objection, a Bill of Rights, was in the process of being finalized in the Bicameral Congress. The prospects of a second Anti-Federalist victory was so bleak that their most outspoken leader, Willie Jones, refused even to attend the Convention. Debate was minimal at the Convention and the Delegates voted overwhelmingly for ratification which occurred on November 21, 1789. In Convention, August 1st, 1788 and November 21st, 1789. 17th. That the people have a right to keep and bear arms; that a well regulated militia composed of the body of the people, trained to arms, is the proper, natural and safe defense of a free state. That standing armies in time of peace are dangerous to Liberty, and therefore ought to be avoided, as far as the circumstances and protection of the community will admit; and that in all cases, the military should be under strict subordination to, and governed by the civil power. 10. That religion, or the duty which we owe to our Creator, and the manner of discharging it, can be directed only by reason and conviction, not by force or violence, and therefore all men have an equal, natural and unalienable right to the free exercise of religion according to the dictates of conscience, and that no particular religious sect or society ought to be favored or established by law in preference to others. J HUNT Secretary . . . IN CONVENTION Whereas The General Convention which met in Philadelphia in Pursuance of a recommendation of Congress, did recommend to the Citizens of the United States a Constitution or form of Government in the following words Vizt. 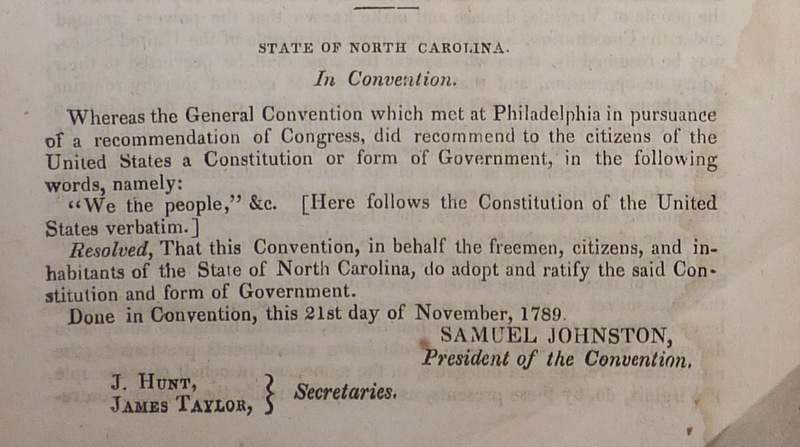 Resolved, that this Convention in behalf of the freemen, citizens and inhabitants of the State of North Carolina, do adopt and ratify the said Constitution and form of Government. Done in Convention this 21 day of November 1789. A month later, Samuel Johnston resigned his governorship and accepted the legislative election to the United States Senate serving until 1793. In 1800 he was made a Judge in the Superior Court of North Carolina, an office he held until his retirement in 1803. On August 17, 1816 Samuel Johnston died at "the Hermitage," his home near Williamston in Martin County, North Carolina. He is buried at the Hayes Plantation Cemetery, former known as the Johnston Family Cemetery in North Carolina.